I’m not sure if this is actually a custom minifig or not, but i really like the decal, so I’m posting it up to see if anyone knows, i think its really cool and with the grey legs it looks really neat, if it is a standard Lego part I’ve got to get a few. 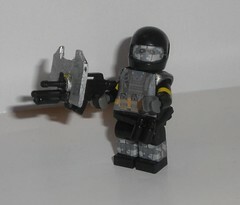 This is a very peculiar custom minifig by exxtrooper, the custom weapon is very interesting and looks like it’s been made of several interesting elements. the decals on this custom minifig however are very unusual, I’m not sure what or whom this minifig is meant to represent, but, it does look cool. I really like the face decal on this Halo minifig, there’s just something really nice looking about the orange glasses, the only down side is that this is a sticker rather than a waterslide decal so it might fall off and makes the minifig pretty fragile to play with.